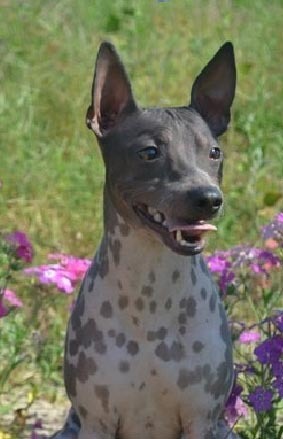 The American Hairless is an energetic, alert, curious and intelligent companion dog. As the net's first resource for AHT information, we invite you to meet top American Hairless Terrier breeders and explore the Reference sections. Distinctive qualities that only those who live with American Hairless Terriers can really know and share. These responsible breeders provide candid insight on the AHT and can help you find a family pet or a show quality dog. The first side-by-side comparison between UKC and AKC American Hairless Terrier Standards, Judges materials, fascinating American Hairless Terrier Breed History, grooming, training, and enjoying life with a AHT! What can YOU do for your breed! Please help us inform over 1.2 Million individual visitors. Scroll down to Submit American Hairless Terrier information for pet owners, judges (TheJudgesPlace) and breeders, or call (800) 215-1178 weekdays 9:30 - 4:30 EST for advertising (see ad rates). Do you have AHT photos or cornerstone dogs? What's behind your line? How better to share with students of the breed?